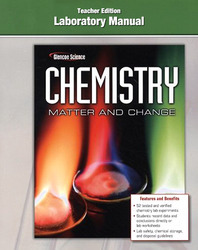 Containing 52 tested and verified chemistry lab experiments, this Laboratory Manual follows the chapter sequence and reinforces the concepts taught in Glencoe Chemistry: Matter and Change, but can be used with any chemistry text. Students record data and conclusions directly on lab worksheets; safety, chemical storage, and disposal guidelines are included. The Teacher Edition adds teaching tips, helpful comments and suggestions, objectives, process skills, and time allotments, as well as answers to all the questions.